Making the right decision when it comes to your child’s education is of utmost importance, and this is never more true than in middle school. Parents are often full of questions when boarding school becomes an option. Here are some important areas to address. A safe, welcoming, and well supervised environment is a must when it comes to your middle school aged child. The facilities and teachers can be good, but as a parent you know that if you are not comfortable with your child’s security nothing will reassure you. This is why safety is always the number one concern. Here at Brillantmont we take this very seriously. We are unique among international schools in that our class sizes are small and thus our teachers and staff get to know each student individually and supervision both in the classroom and on outings is easy. Staff and teachers are easily accessible when students have questions or problems come up, and because of the small size of the school, issues that do arise can be quickly addressed. Real estate agents and parents alike know the wisdom of these words. This is why hundreds of parents from around the world send their children to Switzerland every year for boarding school. 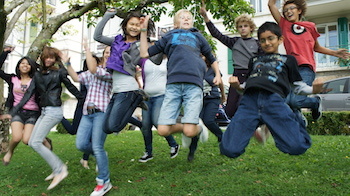 Swiss boarding schools have an excellent reputation abroad for their beautiful locations and exceptional academic environments. Because of this, many expats and local parents also take advantage of the exceptional education opportunities available. Brillantmont, located in Lausanne on the shores of the gorgeous Lake Geneva, is in the perfect location for a culturally rich and stimulating education to occur. As an international school, our placement in the French speaking region of Switzerland is also ideal for language learning. In addition to the exceptional natural beauty of the country, many parents pick this part of the world to send their children to because Switzerland is known for its security and stability. Often the friendships made in primary and middle school last the longest and are particularly important for people throughout their lives. Where would be a better place to build these early connections than an international boarding school? At Brillantmont, your child will meet other children their age from all over the world. These early friendships that often later bloom into important connections, are fostered on a daily basis with small class sizes in the middle school years. There are many things to consider when making the decision as to where to send your child to middle school. We hope that you will consider Brillantmont were we try to address all of your concerns. Please contact us if you would like more information or have any specific questions. Click here to find out more about our middle school programme!